Massinga Beach is Mozambique’s newest secret. The first guests in December 2011 are quoted on TripAdvisor … “Compared to other resorts this really is a jewel in Mozambique.” Since then, Massinga Beach is rated No.1 of 22 speciality lodgings in Mozambique. Mozambique’s coastline is a haven of squeaky white beaches, rustling palms and many resorts and lodges to beckon holiday makers; the most exciting of the newbies is Massinga Beach. 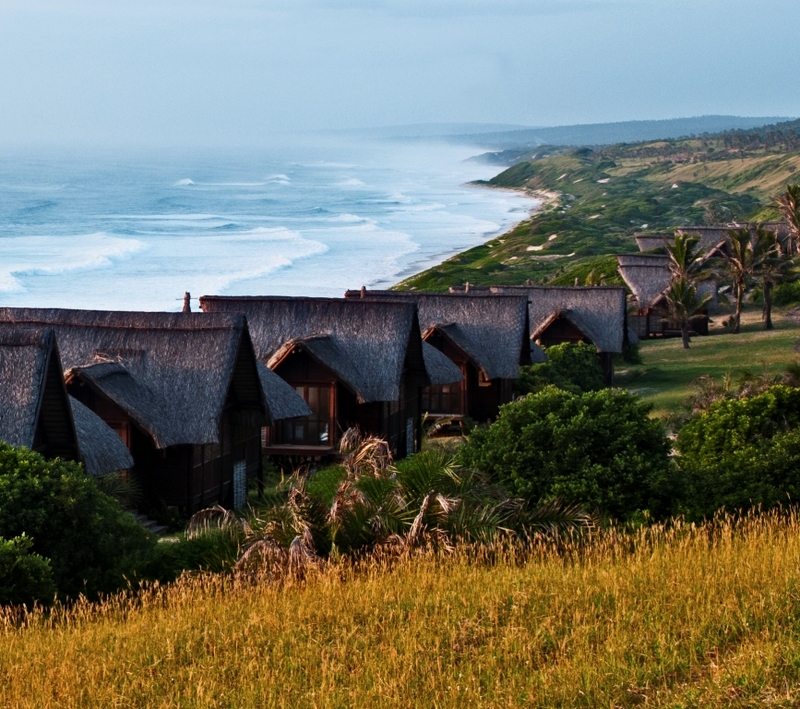 Opened in December 2011, the lodge is located 89 kms north of Inhambane, on the coast where this mainland Lodge sits on a breathtaking, remote 1,3km stretch of seemingly endless, pristine beach. Whilst most upmarket resorts are located on the islands, here is one that is accessible by road and yet is near enough to Inhambane Airport to appeal to all modes of travel. Early signs are that this Lodge is set to be a firm favourite with discerning divers, fishermen and families but particularly honeymooners or romantics wanting to get away from it all. 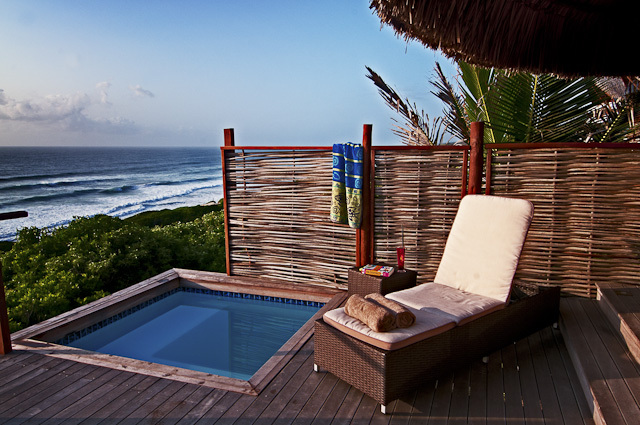 Each Ocean Front Room has a private splash pool, deck and sun loungers, complimented by spacious lodgings including an outsized king bed, luxurious white bath sheets, crisp linen, mini bar, laptop safe, mosquito net, free-standing fan, separate air-conditioning. , an en suite rain shower and free-standing bath tub opening out onto a private deck; comfort is assured and relaxation guaranteed. With 180 ̊ ocean views, luxurious accommodation and five-star cuisine, the rest of the world will fade away at Massinga Beach. The 14 Ocean View Suites are ideal for families and include a double bedroom opening on to a deck with sea views, contains a fan & air conditioning, extra length king-bed, luxury linen, wrap around mosquito net curtain, bath robe, slippers room safe, hairdryer, torch, and a bathroom with freestanding bath, rain shower, separate toilet and luxury guest amenities and the Lounge with furnished deck and a 180 ̊ ocean view; 2 sleeper couches, stocked mini bar, tea & plunger coffee, fan & air conditioning & and separate shower/toilet. The seduction of the exquisite views, calming drone of the pounding waves and the remote privacy ensure that Massinga Beach is about tranquility and escapism. But, since being on holiday entails doing as little or as much as your heart desires, the Lodge obliges. Enjoy a back massage on your private deck where you can nod off without moving or take a leisurely stroll to your private picnic on the long white, unspoiled beach. Watch carefully, you may even spot whales cavorting in the distance from the comfort of the elevated decks whilst being served your favourite cocktail. For those a little more energetic; ramble through the sprawling picturesque palm groves, enjoy the thrill of deep-sea fishing or scuba diving nearby. Local community initiatives including the local school invite you to get involved. At night you will be struck by the wonders at the galaxy and feel its stars are within your reach. This secluded escape, the breath-taking views of the untamed beach stretching north and south as far as the eye can see and friendly attentive service is complimented by truly sumptuous cuisine which can be enjoyed at either the Beach Bar or the Leisure Centre. Fresh coconut cocktails and local seafood is prepared and served with flair and a friendly Mozambican twist. immerses guests in unique Mozambique immediately. It is a combination of a short scenic transfer through historic Inhambane followed by a dhow ride, lunch of local specialities and the last stretch in a four-wheel drive through lush palm groves, over the Tropic of Capricorn; to where Massinga Beach lies beckoning.